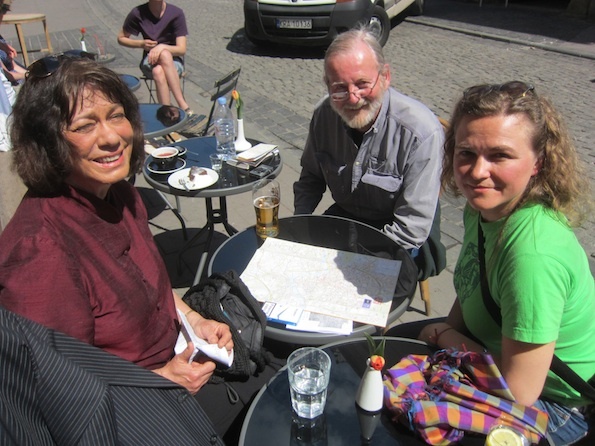 Karen and David relax at Prowincja cafe in Krakow, with Ewa, their stained-glass guide. The Palace at Nakło is like a magnet for artists. Take David Crane, who recently visited with his wife, Karen Kreller. When David wrote to us from Plumsteadville, Bucks County, Pennsylvania, and after I clicked on the link to his studio website to find some of his creations, I knew he’d like this place. David is a sculptor of light and stone. Somehow, through our emails, I got to know David even before he and Karen arrived. With Karen’s planning and direction, and David’s highly responsible and effective driving, they managed to take in Jasna Góra Sanctuary in Czestochowa, the salt mines at Wieliczka, The Auschwitz Memorial and Museum, several old castles and castle ruins in The Eagle Nests, and still had the time to spend two full days in Kraków. There, they visited the uprising museum at Schindler’s Factory, stopped by the Stained Glass Museum for a private tour and saw all of the major stained-glass works in Krakow’s churches. They loved the side trip to Nowa Huta. All of this in six days. David also had a friendly encounter with two of our alert Polish traffic officers. His papers checked out OK, and he was sent on his way with just a kind warning not to drive like everyone else in Poland, and warm wishes for the remainder of his and Karen’s stay. Since they were sleeping and breakfasting at The Palace, we got a chance to debrief David and Karen each bright, sunny morning (we had about 15 of them in a row recently) over coffee in the dining room. With Karen along, they didn’t need much help setting out each day. She’d already mastered the phonetics of Polish cordiality by Day 2. And these Pennsylvanians had a plan! That plan probably didn’t include playing Polish Horseshoes, but we worked in a few games. David and I beat Marzenna and Karen over in the pit, but Karen did throw a ringer on only her third try. By the time they left The Palace this past Monday, we had an invitation to Plumsteadville, and a sweet best wishes in our guest book. David and Karen have traveled all over the world. But we don’t think they will ever forget Poland. We certainly won’t forget them.